PocketTV Classic (freeware) and PocketTV Enterprise Edition is available for the latest Windows Mobile phones. PocketTV MPEG Movie Player and VCD Player takes full advantage of all the features of Windows Mobile Professional, Standard and Classic devices, such as Landscape display, soft-keys, on-the-fly display rotation, VGA resolution, 800x480 wide-screens, etc. Go to the download section and get your FREE copy of PocketTV Classic or buy PocketTV Enterprise Edition now!. PocketTV Classic is FREE for personal use on Windows Mobile phone, Pocket PC, Smartphone and Casio Pocket Manager. PocketTV Enterprise Edition, our commercial product, provides unsurpassed video performances. Then download some free video and copy them to your device to see for yourself! PocketTV Classic is free for personal use. PocketTV is one of the most downloaded third-party Windows Mobile freeware. PocketTV has already millions of users. 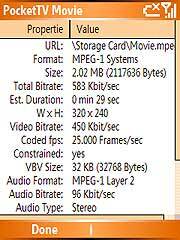 PocketTV can play any standard MPEG-1 video file (extension .mpg or .mpeg), including VCD (Video-CD). PocketTV can play VCD (Video-CD) movies. 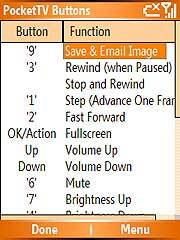 Copy the VCD .dat file in your memory card (using your PC) and change the .dat file extension to .mpg to play with PocketTV. DVD's can be converted into MPEG files and played by PocketTV. 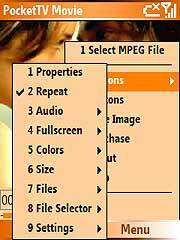 There are many tools (both commercial and free) that can convert DVD's into MPEG files. PocketTV takes full advantage of all the features of Windows Mobile (on-the-fly display rotation, Soft Keys, VGA resolution, etc). On the VGA-resolution devices's, PocketTV takes advantage of the video hardware accelerators chips (such as the ATI Imageon 3200 series or the Intel Marathon 2700G), so it can play VGA-resolution MPEG files (i.e. DVD quality) with optimum quality. Compare PocketTV with Windows Media Player and the other mobile video players. what MP3 is to music! PocketTV can play any legal (compliant) MPEG-1 Video or Systems stream, but performances will be higher when playing MPEG files encoded with parameters optimized for PocketTV on your device. Use our Simple Guide for making MPEG's optimized for PocketTV to convert all your video files (AVI's, MOV's, VCD's, DVD's etc) into MPEG files optimized for PocketTV.